Plant architecture is the primary factor underlying crop production and is important for agricultural practices such as mechanization. 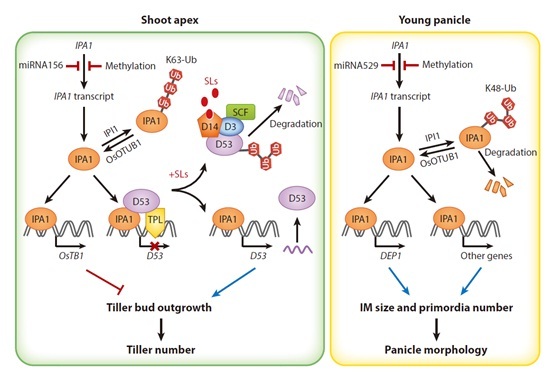 Elucidating the mechanism of shoot architecture regulation is fundamentally important for understanding plant development and also for crop breeding practice. Shoot architecture is regulated mainly by endogenous genetic and hormonal signals, as well as environmental factors such as nutrients, water, light, and temperature. Recently, Prof. LI Jiayang at the Institute of Genetics and Developmental Biology (IGDB), Chinese Academy of Sciences, has been invited to write a review paper entitled “Genetic Regulation of Shoot Architecture” in Annual Review of Plant Biology (doi: 10.1146/annurev-arplant-042817-040422.). The team led by Prof. LI Jiayang has systematically characterized key genes regulating plant architecture components including tiller number, tiller angle, panicle size, grain number, grain weight, and plant height; elucidated the critical roles of strigolactones in shoot architectures. They also cloned and characterized Ideal Plant Architecture 1 (IPA1), a key regulator that defines rice plant architecture, elucidated the molecular basis of rice ideal plant architecture, and improved rice grain yield through applying the beneficial alleles of IPA1. In this review, they discuss common principles of hormonal and genetic control of shoot architecture, focusing on new genes and mechanisms controlling shoot architecture in model system and crop species. They summarize the molecular basis of ideal plant architecture and heterosis in rice and their application in breeding new elite rice varieties. This work is supported by the National Natural Science Foundation of China, the National Key Research and Development Program of China, the Beijing Short-Term Recruitment Program of Foreign Experts, and the Chinese Academy of Sciences.